*All films will eventually be posted online and hosted on both HIFF and DKII websites. 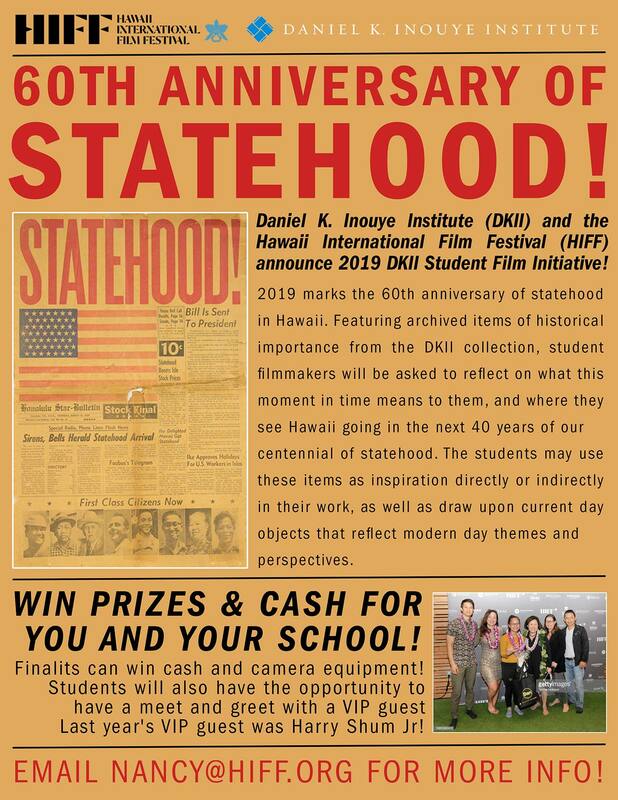 Building on the success of the inaugural year of the Daniel K. Inouye Student Film Initiative, the Daniel K. Inouye Institute (DKII) and the Hawaii International Film Festival (HIFF) will again hold a youth film contest. In 2019 the major goal of the initiative will be to increase outreach and receive submissions from students on all islands. 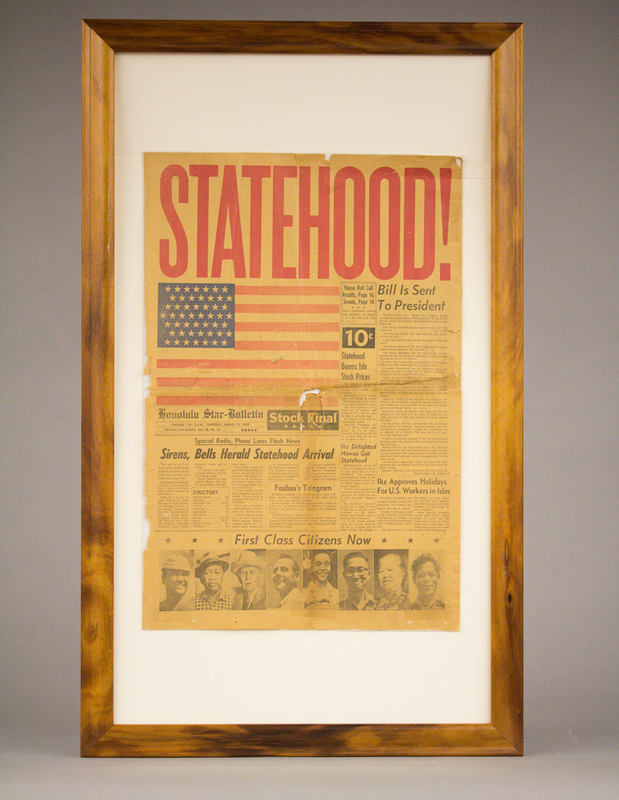 This year, 2019, marks the 60th anniversary of statehood in Hawaii. 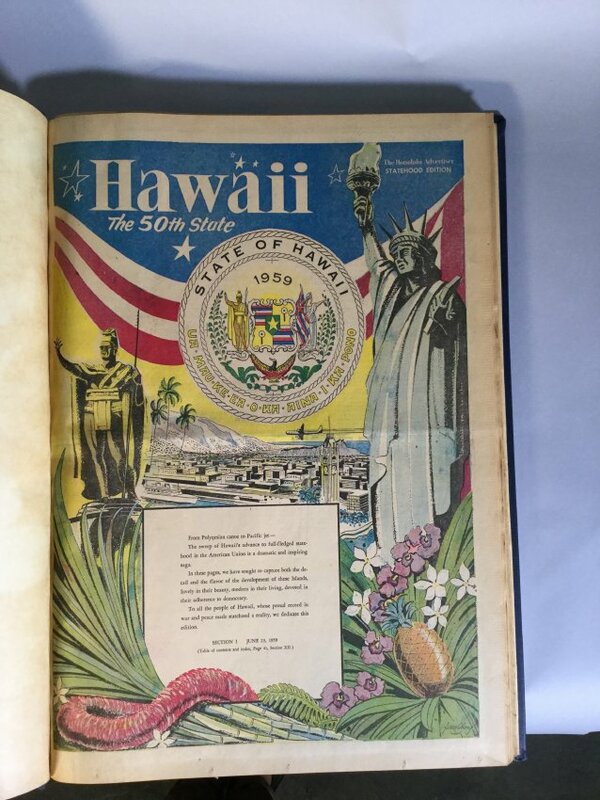 Featuring archived items of historical importance from the DKII collection, student filmmakers will be asked to reflect on what this moment in time means to them, and where they see Hawaii going in the next 40 years of our centennial of statehood. 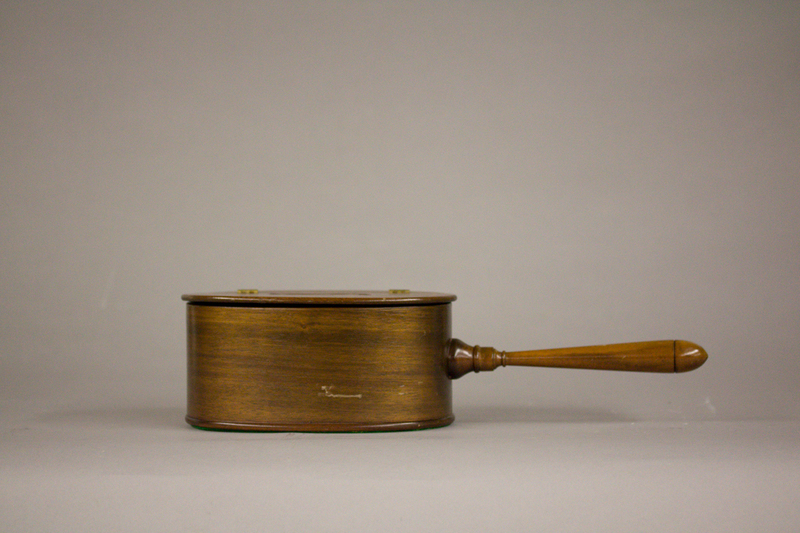 The students may use these items as inspiration directly or indirectly in their work, as well as draw upon current day objects that reflect modern day themes and perspectives. Listening to student feedback from our inaugural year, we will increase the time limit on projects to up to 5 minutes in length. We will also select a High School and Elementary/Middle School awardee and an overall grand prize winner selected from all the entries. Finalists will be chosen to be presented at HIFF 2019 in a special presentation screening as part of the Festival’s annual Student Showcase. These finalists will be given industry filmmaker badges that will provide them unprecedented access to HIFF (free screenings, panel talks, party entry). 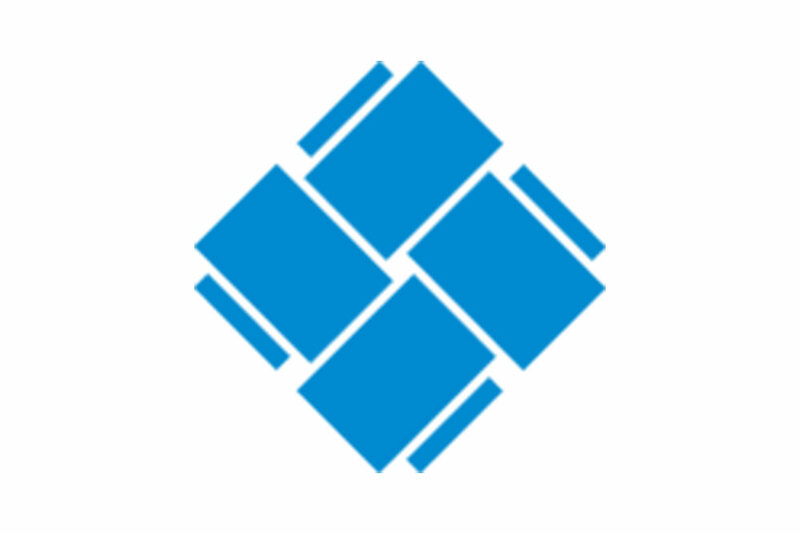 FUTURE FILMMAKER LUNCHEON: Young filmmakers will be invited to a hosted lunch and attend a keynote speech with several young and established talents (i.e. a hip director, or actor, or social media influencer that HIFF will book). Post speech there will be extended Q&A time at student’s individual tables, allowing for more one on one discourse. NEW MEDIA CAMP: A workshop led by a filmmaker and DKII representative where students will be guided on the use of their prize GO PRO and have an extended discussion on the use of media in activism. *This will take place after the festival at the winning student’s school when appropriate for the school. 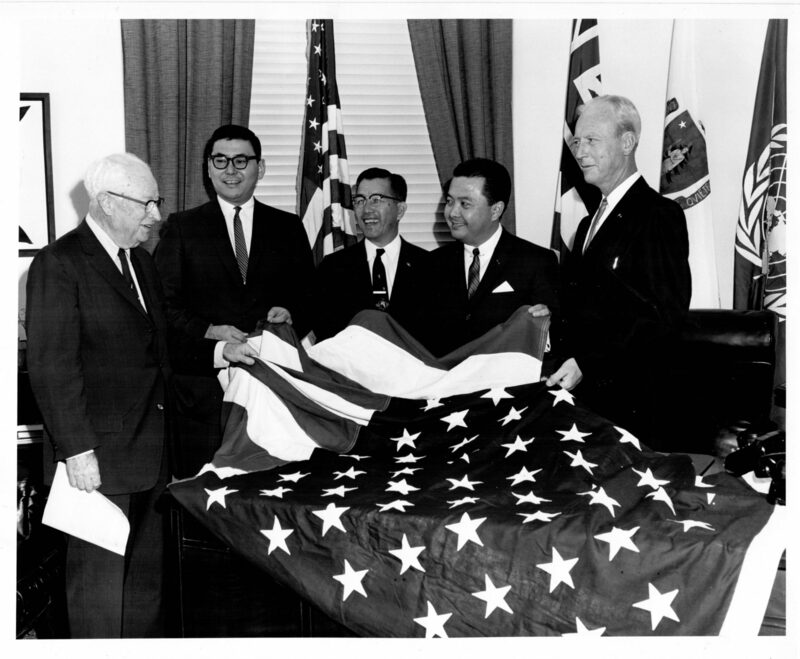 Inouye Burns and others with new 50 star flag probably 1959 from UH Arc Inouye collection: Group shoot with new 50-star flag; left to right –The Architect of the Capitol, J. Geo. Stewart, Kenneth Nakamura, Thomas Takamune, Daniel K. Inouye & then Delegate from Hawaii Jack Burns. 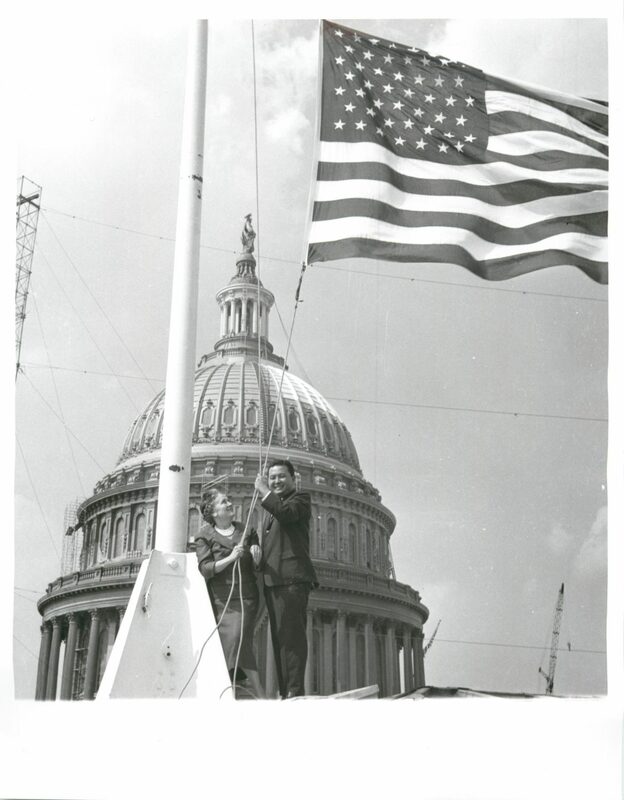 Photo 1143 Senator with Flag on US Capitol: Then Congressman Daniel K. Inouye (Hawaii’s first elected U.S. Representative) with American flag with 50 stars in Washington D.C., U.S. Capitol. 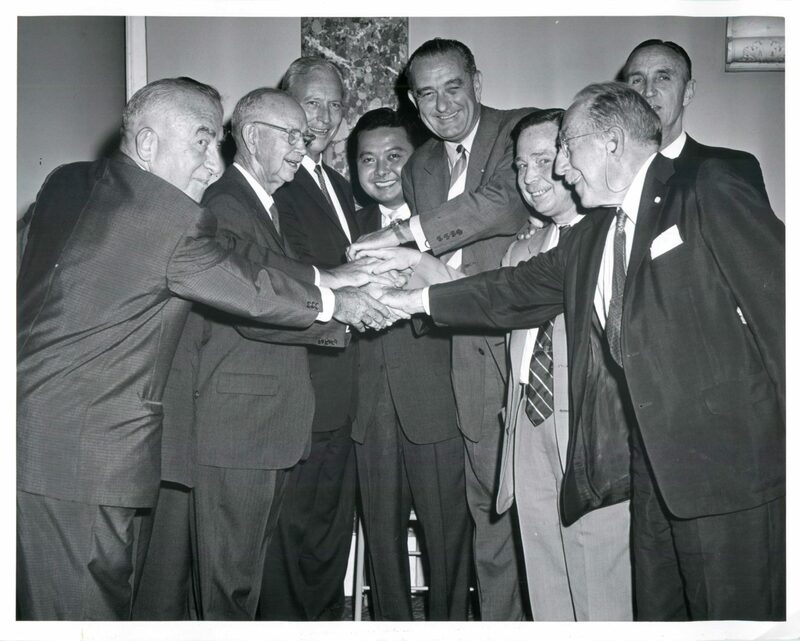 Photo 1959 group shot: Pre-signing into Statehood huddle including Daniel K. Inouye, U.S. Senator Ernest Gruening (Alaska), then Delegate from Hawaii Jack Burns, then U.S. Senator Lyndon B. Johnson, Congressman Carl Albert (Oklahoma), newly elected U.S. Senator from Hawaii Oren Long, and U.S. Senator Mike Mansfield. 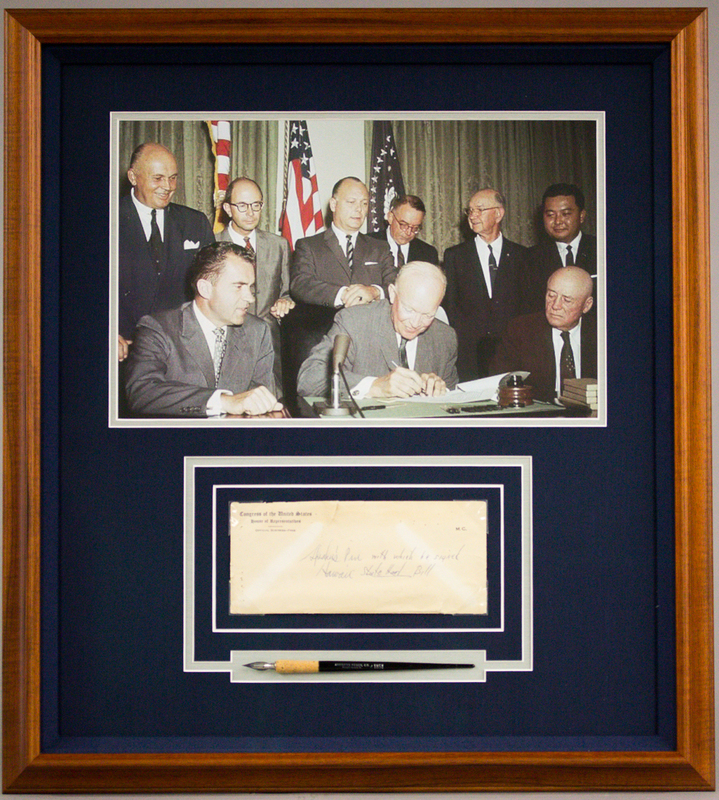 285-2: Framed photo of the signing of Hawaii Statehood Bill by President Eisenhower with Daniel K. Inouye, Hawaii’s first elected U.S. Representative; the House of Representatives Official Envelope and the Speaker of the House of Representatives pen with which was used to sign the Hawaii Statehood Bill. 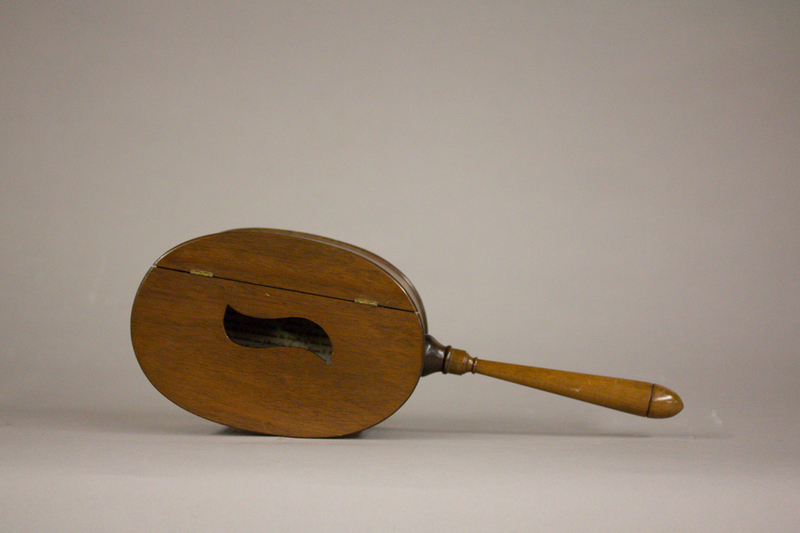 318-2,3: Used to classify Senators from new states. On January 7, 1959, Alaska & Hawaii Senators drew slips to ascertain their terms of service (2,4 or 6 years). 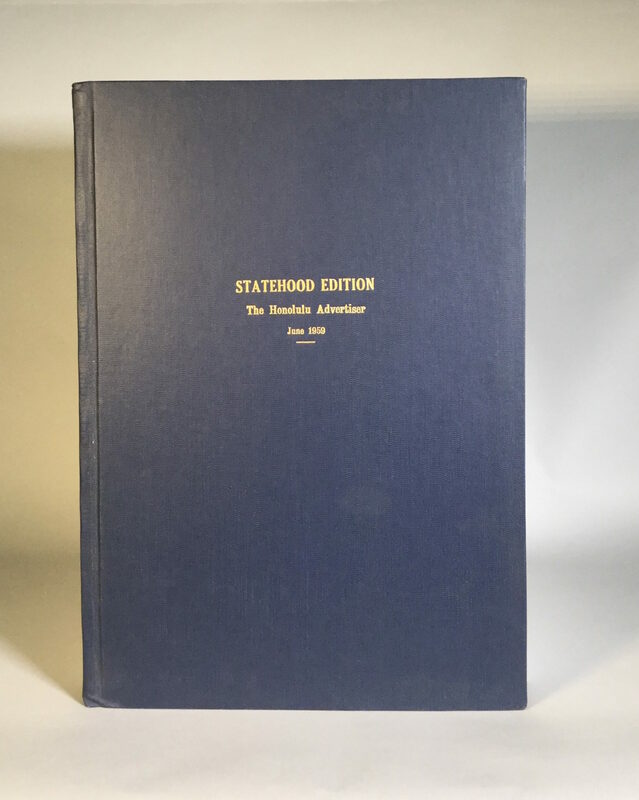 1296-3,4: Special book bound edition of the Honolulu Advertiser for Statehood, June 1959, presented in embossed box. 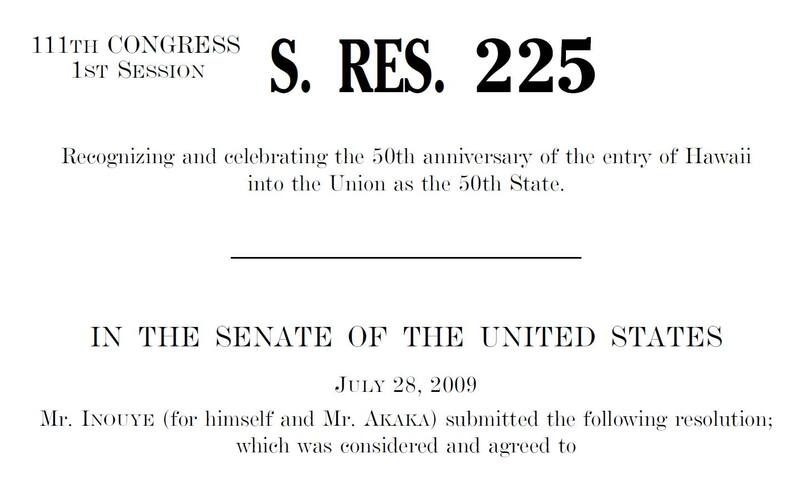 Statehood Resolution S Res 225 2009 111th Congress bill text: Resolution recognizing the 50th anniversary of Hawaii becoming the 50th state.